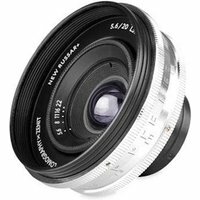 Based on the older Russar MR-2, the Lomography 20mm f5.6 lens is a stunning brass-bodied prime with significant design improvements for use with Leica L39/M analogue cameras and digital mirrorless cameras. This ultra-wide 20mm lens allows you to capture everything around you from stunning perspectives and is a great tool for architectural work, landscapes travel and street photography. The 20mm Russar+ Art produces super-sharp images filled with vibrant colours, vignettes and contrasts, bursting with the unique character and quality. The lens also has excellent distortion control to avoid barrel and pincushion distortions.